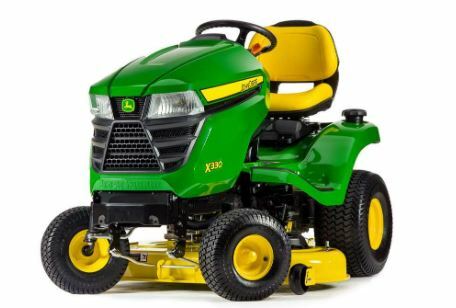 Do you Want to Buy a new tractor from the Deere’s X300 Series lawnmower? Then, do not bother more about it. 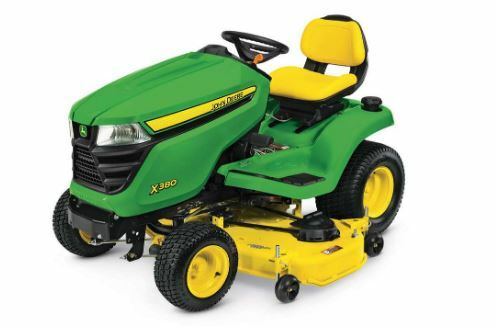 Today, I am here to share some important and informative details of Deere’s X300 Series lawnmower tractors in this post. 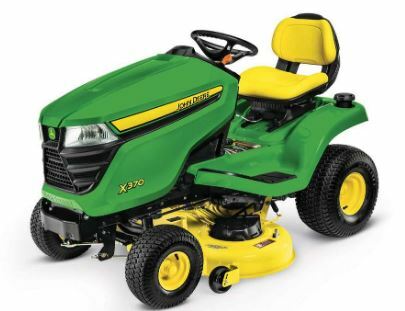 So, read this post carefully and learn all the key specification of all models of John Deere X300 Series lawnmower tractor with prices. In this post, you can get details of engine type, transmission system, steering, traveling speeds, manual, attachments, prices, lifting and fuel tank capacity, etc in this single post. 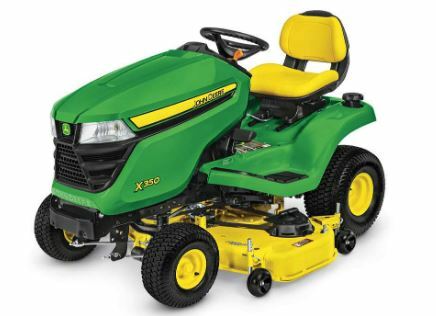 Let us know all these features and prices of all lawnmower from the X300 series, step by step. It is Powered by the 20 hp Cyclonic, V-twin cylinders engine with 42-in. Accel Deep Mower Deck attachment. 20 hp or 14.9 kW gross engine horsepower rating. Overhead valve and full-pressure lube with oil filter type engine. It is loaded with the Upgraded instrument panel. Separate levers for the speed control with the facility of automatic choke return and mechanical governor. An Air based cooling method with Dry and replaceable air cleaner with the foam pre-cleaner. Fuel tank capacity of 3.3 U.S. gal. of gasoline or 12.5 Ltr gasoline fuel. Regulated, 14 amp, Flywheel alternator as the charging system. Facility of Bendix as the Engine starter, Hour meter, Two standard and incandescent headlights and optional 12-V outlet. K46 hydrostatic integrated transmission system with the transaxle. Facility of a button on the dash for the cruise control with Twin Touch pedals for the control. Internal and not replaceable oil filter and Fins with fans on the transaxle for the air cooler purpose. Forward Travelling speeds – 0 km/h to 8.9 km/h. Reverse travelling speeds – 0 km/h to 6.4 km/h. Internal wet disc braking system with Welded heavy duty frame chassis. Cast iron and front wheel ball bearings type front axle. Hooding Material – Molded-in color hooding material to reduce the sound. It also does not rust and dent. Sector and pinion type manual steering with Open and back design seat with grasp. Seat suspension – Tilt with two coil springs and three positions, no tool needed for the adjustment for the operator weight. Facility of Foot pedal along with the optionally adjustable spring assist kit for the lifting purpose. Facility of 42 in., Side discharge mower deck with Stamped and steel deck shell. Electric PTO (power take-off) with in-line belt clutch. Two mower wheels with Four positions tooting Mower wheel adjustment. Single belt drive system with Slide under tractor type mower attachability. Durable E-coat primer with powder paint finish. 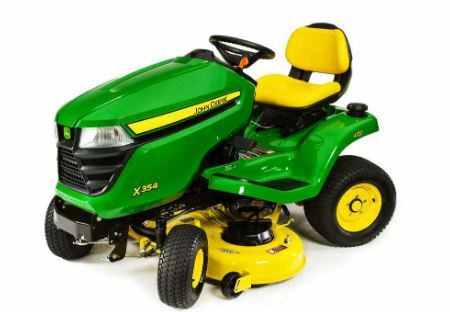 Facility of 42A (standard) mower, Rear bagger, Mulching system, Front thatcher, 44 in. Front blade, Two-stage, 44 in. snow blower, sprayer, spreader, Brush guard, Sun canopy for the protection from the weather, double bucket holder and Lawn striping kit as the optional equipment. It is Featured by 18.5 hp (13.8 kW), iTorque Power System with a facility of 42 inch Accel Deep Deck. Engine Horsepower rating of 18.5 hp (13.8 kW) to produce a displacement of 36.8 cubic inches. Overhead valve, full-pressure lube and oil filter, V-twin cast iron type engine. Mechanical governor with Separate levers for the speed control (automatic choke return). Air cooling method with the Dry air cleaner. (Air cleaner replaceable with the foam pre-cleaner). Fuel tank capacity of 3.3 U.S. gal. or 12.5 Ltr gasoline as fuel. Flywheel alternator charging system (regulated, 15 amp). Two standard and incandescent (27 W) headlights for the clear view with the facility of hour meter. Twin Touch pedals for the control and facility of cruise control on this model. Oil cooler – Fins & fan on the transaxle and Internal oil filter (not replaceable). Max and Min Forward traveling speeds – 0 km/h to 8.9 km/h. Max and Min Reverse traveling speeds – 0 km/h to 6.4 km/h. Welded heavy-duty frame for the chassis and Internal wet disc type brakes. Molded in color hooding material, which reduces the sound. It does not rust and dent in crucial conditions. A type sector and pinion manual steering. Design with Open back seat along with grasp. Foot pedal for the lifting purpose with the optionally adjustable spring assists kit. 42 in. Side discharge mower deck with Stamped steel deck shell and Slide under tractor mower attachability. Facility of Electric PTO (power take-off) and in line belt clutch. Facility of 42A (standard) mower, Mulching system, Rear bagger, Front thatcher, Two stage, 44 in. snow blower, 44 in. Front blade, sprayer, spreader, Sun canopy for the protection from the weather, Brush guard, double bucket holder with Lawn striping kit as the optional equipment. It is loaded with 18.5 hp (13.8 kW) and iTorque Power System with a facility of 42 inch Accel Deep Deck. Overhead valve with full-pressure lube and oil filter, V-twin cast iron type engine. 18.5 hp (13.8 kW) Engine Horsepower rating and produces a displacement of 36.8 cubic inches (603 CC). A Separate levers for the speed control (automatic choke return) along with the Mechanical governor. A regulated and 15 amp Flywheel alternator charging system. Dry air cleaner. (Air cleaner replaceable with the foam pre-cleaner) with Air Cooling System. Facility of Bendix engine starter, Two standard and incandescent (27 W) headlights for the clear view with the facility of hour meter. Facility of cruise control on this model and Twin Touch pedals for the control. Oil cooler – Fins & fan on the transaxle with not replaceable Internal oil filter. A type sector and pinion manual steering with an Open back designed seat along with grasp. Electric PTO (power take-off) along with in-line belt clutch. Facility of long Durable E-coat primer and powder paint finish. 42 in. Side discharge mower deck with Stamped steel deck shell. Facility of Roll under tractor mower attachability with spring pins at the two points. Internal wet disc type brakes. Welded heavy-duty frame for the chassis. Tilt seat suspension, two coil springs with three positions (no tool required for the adjustment for the operator weight). Dual belt drive system with four mower wheels and Power Flow blower for the Powered material collection. Facility of Reverse Implement Option (RIO) for the operator Backup protection. The overall weight of tractor – 275 kg with no fuel. Facility of mower wash port with 13 positions, 1 inches to 4 inches Mower cutting height. Powered by 18.5 hp (13.8 kW) V-twin cylinders, full-pressure and lubricated, air-based cooling system type engine. Facility for Rear discharge and rear collect deck for the clean cuts. A rear hopper having a large capacity, which is also easy to empty. Low fuel indicator fuel gauge and carburetor for the fuel delivery. Fuel tank capacity – 2 U.S. gal. (7.6 Ltr) gasoline fuel. Dry air cleaner. (Air cleaner replaceable with the foam pre-cleaner). Flywheel alternator charging system (regulated and 15 amp) along with the Air cooling method. Facility of hour meter along with Two standard and incandescent (27 W) headlights for the clear view. Bendix engine starter and Internal oil filter (not replaceable). Fins & fan on the transaxle as the oil cooler and Twin Touch pedals for the control. Forward traveling speeds – 0 km/h to 8.5 km/h. Reverse traveling speeds – 0 km/h to 6.4 km/h. Facility of cruise control on this model. Internal wet disc brakes and Welded heavy-duty type chassis. Facility of Electric PTO (power take-off) and in line belt clutch with the sector and pinion type manual steering. Rear discharge with rear collect and mulch type, 42 in. mower deck. In line belt clutch with Facility of Electric PTO (power take-off) transmission system. Three mower wheels with Four positions and tool required for the Mower wheel adjustment. Dual belt drive system with Slide under tractor mower attachability. Facility of Standard mulch plug for the mulching system, 42 inch Rear discharge and rear collect (standard) mower, Rear bagger, Front thatcher and 44-inch front blade as the optional accessories. Two-stage, 44-inch Snowblower with Sprayer, spreader, Lawn striping kit, Brush guard, and Styled bumper option are available as the optional equipment for this model. Lawn tractor weight without fuel – mower only – 293 kg. It is loaded with 18.5 hp (13.8 kW), iTorque Power System engine with 42-in. Accel Deep mower deck. Featured by Exclusive 4 wheel steering for the excellent maneuverability. 18.5 hp horsepower rating engine to create a displacement torque of 36.8 cu in. (603 CC). A replaceable dry Air cleaner with the foam pre-cleaner. Facility of Air cooling method with the mechanical governor. Flywheel alternator charging system (regulated and 15 amp). Internal oil filter (not replaceable) with Facility of cruise control on this model. K46 hydrostatic and integrated transmission with the transaxle. Two standard and incandescent (27 W) headlights for the clear view and loaded with an hour meter. Side discharge mower deck having 42 in. cutting width. Twin Touch pedals for the control and sector and pinion, manual steering. Electric PTO (power take-off), in line belt clutch. Internal wet disc brakes along with the Welded heavy-duty type frame chassis. For lifting – Foot pedal with a non-adjustable spring assist kit. Two mower wheels along with the Four positions for the Mower wheel adjustment (tool required). Slide under tractor mower attachability with the Single belt drive system. Facility of Reverse Implement Option (RIO) for the operator backup protection as safety and security. Facility of 4 wheel steering for the unmatched maneuverability having trimming capability. 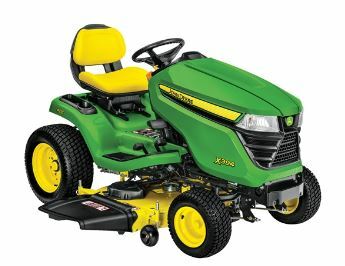 Facility of the 42-inch standard mower, mulching system, Two-stage, 44-inch Snowblower and Lawn striping kit as the optional accessories. Facility of the Rear bagger, Brush guard, Front thatcher, Sprayer, spreader, sun canopy, double bucket holder, and 44-inch front blade as the optional equipment for this model. Lawn tractor weight without fuel and mower only – 283 kg. Max & Min Forward traveling speeds – 0 km/h to 8.9 km/h. Max & Min Reverse traveling speeds – 0 km/h to 6.4 km/h. It is powered by 18.5 hp (13.8 kW) with iTorque Power System engine and 42-in. Accel Deep mower deck. Overhead valve, full-pressure lube, oil filter type engine system and displacement torque of 36.8 cu in. (603 CC). V-twin type cast-iron liners cylinders with the mechanical governor. A regulated, 15 amp Flywheel alternator charging system. An air-based cooling system with a replaceable dry Air cleaner with the foam pre-cleaner. Fuel tank capacity of 3.3 U.S. gal. or 12.5 L gasoline fuel. Fins & fan on the transaxle for the oil cooler and Bendix engine starter. Facility of Two standard and incandescent headlights for the clear open view. Featured with an hour meter and K57 hydrostatic integrated type transmission system with the transaxle. Facility of Side discharge mower deck, 42 in cutting width and Electric PTO (power take-off). Facility of cruise control system with an Internal and replaceable oil filter. Forward traveling speeds – 0 km/h to 9.3 km/h. Reverse traveling speeds – 0 km/h to 5.6 km/h. Twin Touch controlling pedals with the Internal wet disc brakes. Facility of Power and hydraulic steering for the smooth working and better comfort. Hydraulic type lifting system and Welded heavy-duty type frame chassis. 42 in. Side discharge mower deck with Slide under tractor mower attachability. Two mower wheels with the single belt drive system. Single piece hood for the easy service access with comforts. Open-back design grasp seat for the comfortable drive. Lawnmower weight, without fuel – mower only – 259 kg. Facility of the double bucket holder, Brush guard, Rear bagger, Sprayer, spreader, Front thatcher, sun canopy, and 44-inch front blade as the optional accessories for this model. Facility of the Two-stage, 44-inch Snowblower, mulching system, 42-inch standard mower, and Lawn striping kit as the optional equipment. Displacement torque – 36.8 cu in. (603 CC). Cylinders – V-twin, cast-iron liners. Fuel tank capacity – 3.3 U.S. gal. or 12.5 L gasoline fuel. Mechanical governor with Flywheel alternator charging system (regulated, 15 amp). A dry Air cleaner (replaceable with the foam pre-cleaner) and air cooling system. Two standards, incandescent headlights along with Fins and fans on the transaxle for the oil cooler. Facility of cruise control on this model along with Bendix engine starter, hour meter, and Internal and not replaceable oil filter. K58 hydrostatic integrated transmission system with the facility of Electric PTO (power take-off). Welded heavy-duty chassis frame with the facility of cruise control system. A sector and pinion type manual steering with Open and 15 in high, back design seat with a grasp for comfortable driving. Facility of Foot pedal along with the adjustable spring assist for the lifting purpose. Internal wet disc brakes with the facility of Twin Touch controlling pedals with the Dual belt drive system. Facility of a Single piece hood for the easy service access with comforts. For the Backup protection, it is loaded with Reverse Implement Option (RIO). Facility of the Sprayer, spreader, double bucket holder, Rear bagger, sun canopy, Front thatcher, Brush guard, and 44-inch front blade as the optional accessories for this model. Maximum and Minimum Forward traveling speeds – 0 km/h to 10 km/h. Maximum and Minimum Reverse traveling speeds – 0 km/h to 5.6 km/h. Lawnmower weight, without fuel – mower only – 295 kg. Featured with Exclusive 4-wheel steering for the excellent maneuverability. V-twin type cast-iron liners cylinders with Flywheel alternator charging system (regulated, 15 amp) and facility of a Mechanical governor. An air-based cooling method with dry Air cleaner, which is replaceable with the foam pre-cleaner. Two standards and incandescent headlights along with the facility of cruise control and Fins and fans on the transaxle for the oil cooler. Facility of an hour meter, Bendix engine starter, and Internal and not replaceable oil filter. Max and Min Forward traveling speeds – 0 km/h to 9.5 km/h. Max and Min Reverse traveling speeds – 0 km/h to 5.6 km/h. For lifting purpose – Facility of Foot pedal along with the adjustable spring assist. Twin Touch controlling pedals, Internal wet disc brakes, along with the A sector and pinion type manual steering. 48 in. Side discharge mower deck with Roll under tractor mower attachability on this lawn tractor and Dual belt drive system. It meets the criteria of Reverse Implement Option (RIO) as the operator backup protection. 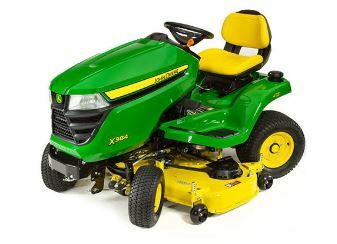 Facility of the Lawn striping kit, 48-inch standard mower, Two-stage 44-in Snowblower, and mulching system optional accessories for this lawn mower. Facility of the Front thatcher, Rear bagger, Sprayer, double bucket holder, spreader, sun canopy for the weather protection, Brush guard, and 44-inch front blade as the optional equipment for this model. 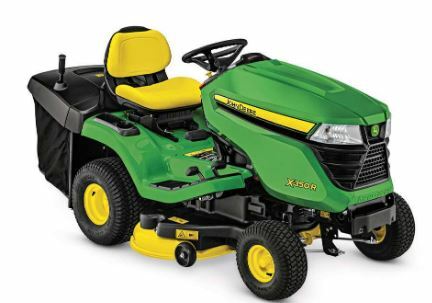 Lawnmower weight, without fuel – mower only – 318 kg. Powered by 22 hp (16.4 kW) horsepower engine rating, iTorque Power System with an Automotive-style power steering and 48-in. Accel Deep Deck with it. Overhead valve, full-pressure lube, oil filter, V-twin (cast-iron liners) type cylinders engine. A Mechanical governor and Separate levers for the speed control with an automatic choke return system. Dry air cleaner system (replaceable with foam pre-cleaner) along with the air based cooling method. Gasoline fuel tank capacity – 3.3 U.S. gal. (12.5 Ltr). Forward traveling speed – 0 km/h to 10 km/h. Reverse travelling speed – 0 km/h to 5.6 km/h. Charging system- Flywheel alternator, regulated, 15 amp along with Bendix engine starter. Transmission system – K58 hydrostatic integrated type transmission with the transaxle. Twin Touch pedals and facility for the cruise control. Oil cooler – Fins and fan on transaxle and Internal and not replaceable oil filter. Chassis Frame – Welded heavy-duty and facility for the Internal wet disc brakes. Metal and replaceable Spindle bushings. Facility of Molded-in color hooding material, which reduces the sound and does not rust and dent. Heavy duty Equipment mounting along with the facility of hydraulic power steering. Standard Tilt steering wheel with five positions having a Turning radius of 22 in. Open and back design seat with a grasp for the comfortable drive. 48 in. Side discharge mower deck with Roll under tractor mower attachment. Electric PTO (power take-off) and Hydraulic lifting system, with in-line clutch and duel belt drive system. It is featured with the Hydraulic powerlifting system for the superior convenience with the ease of use. It is also featured with the Power steering with a tilt steering wheel for the exceptional comfort and maneuverability. 48A (standard) mower, Powered material collector, Rear bagger, Front thatcher, Front blade, and a facility for the Mulching system on this model. Two-stage, 44 in. snow blower, Sprayer, and spreader with the Brush guard, sun canopy for the weather protection, lawn striping kit along with double bucket holder are available on this model as the optional equipment to perform various activities. 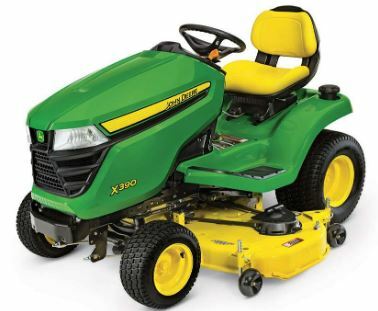 Overall Mower weight without fuel in it – 308 kg. Powered by 22 hp horsepower engine rating, iTorque Power System with 48-in. Accel Deep Deck with it. 22 hp (16.4 kW) horsepower rating engine which creates 44.3 cu in. displacement. It is featured by a 4-wheel steer and Automotive-style power steering. Choke/speed control – Separate levers, automatic choke return with the Mechanical governor. Overhead valve, full-pressure lube, oil filter type engine with V-twin (cast-iron liners). Air cleaner – Dry, replaceable with foam pre-cleaner with no tools for oil drain. Headlights – Two standards (incandescent, 27 W) along with the Flywheel alternator (regulated, 15 amp) type Charging system. Transaxle Type – K58 hydrostatic integrated with the transaxle. Max, Min Forward traveling speed – 0 km/h to 10 km/h. Max, Min Reverse travelling speed – 0 km/h to 5.6 km/h. Welded heavy-duty type chassis frame and facility for Metal and replaceable Spindle bushings. Hydraulic power steering, Twin Touch pedals, and facility for the cruise control. Internal and not replaceable oil filter with the Fins and fan on transaxle for the oil cooler. Facility for the 48 in. standard Side discharge mower deck with Roll under tractor mower attachment with it. A molded-in color hooding material, which reduces the sound and does not rust and dent. Power steering with the tilt steering wheel for the exceptional comfort and maneuverability. Electric PTO (power take-off), in-line clutch, Hydraulic lifting system, and duel belt drive system. Facility for the 48A standard mower, Rear bagger, Powered material collector, Front blade, Front thatcher, and a facility for the Mulching system on this model. Sprayer, and spreader, Two-stage, 44 in. snow blower, with the Brush guard, lawn striping kit, sun canopy for the weather protection, along with double bucket holder is available on this model as the optional equipment to perform various activities. Overall Mower weight without fuel in it – 342 kg. 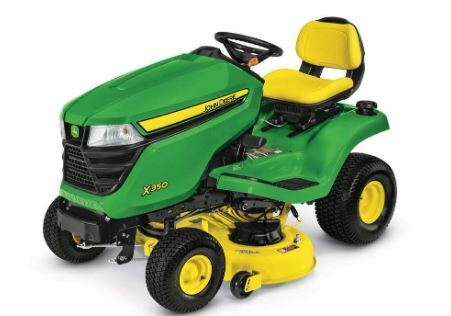 Hope that this post is helpful for you in deciding #which is the best lawn tractor from the John Deere, X300 Series with their price list and key features.